Study finds best results from higher protein, low GI diet – what’s it mean for you? But what the article missed is that the more correct way to look at the nutrition value of glycemic effect of foods is to look at the glycemic load versus the glycemic index. The issue with the index is that it doesn’t take into account the portion control aspect of nutrition. Thus, you will see carrots as seemingly very high, as the article points out, but you would have to eat a lot more carrots than a typical portion to get that high effect. That said, if having carrot soup or carrot juice, because the carrots are processed they will have a higher glycemic effect. So net net, if you don’t want to follow a list – and perhaps you even want to try a more plant-based diet for all the various health benefits – the best thing to do is to focus on eating the highest quality carbohydrates and eating them in their whole food form. What does this mean? Whole fruit versus dried or juiced – and if you are sugar-sensitive then go for the ones we eat the skin of as opposed to the ones we don’t (think apple versus pineapple) more often. When it comes to grains, eat the whole grain versus the puffed or flour-based product – skip the rice cakes and have a whole grain cracker for example or have a bowl of oats or quinoa versus a puffed cereal. In terms of protein sources, look to quinoa and legumes like lentils but also know that hemp seeds provide complete protein and many of your other nuts and seeds are rich in amino acids. And overall, practice nutrient balance which means aiming for a serving of each – carb + protein + healthy fat – at an eating occasion. You can see how to make the right selections using the AKA menu worksheet. where each company discussed why they are committed to organic food and then opened up for a lively discussion with panelists: Chensheng (Alex) Lu, Ph.D., Mark and Catherine Winkler Assistant Professor of Environmental Exposure Biology Exposure, Epidemiology, and Risk Program Department of Environmental Health Harvard School of Public Health; Jeff Moyer, Farm Director, at the Rodale Institute; and Katherine Musgrave, RD, Professor Emerita of Foods and Nutrition at the University of Maine as well as a question period from dietitians. To view the entire video, please contact colleen@ashleykoffapproved.com to receive a download. 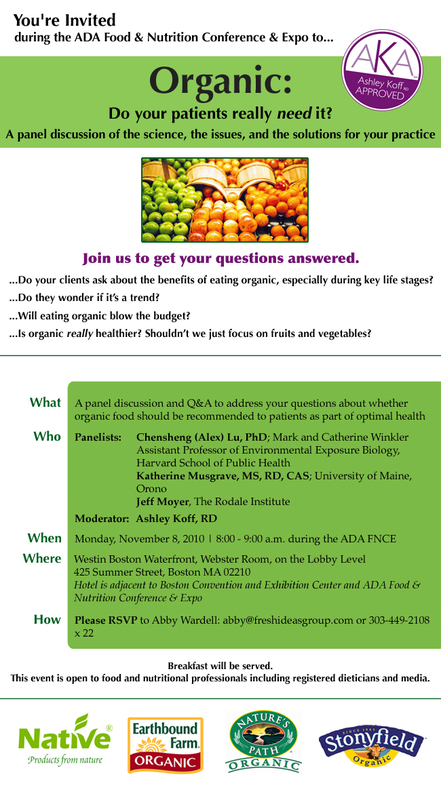 Are you a dietitian interested in learning more about organic farming, the science of organic food, and what patient resources are available? Email us to be included in upcoming events including a late spring trip / farm tour to the Rodale Institute. When the Indians and Pilgrims gathered to the table, there were no artificial ingredients, no chemicals, no science lab experiments, and there were lots of veggies – When it comes to Thanksgiving, let’s take a play from History’s playbook and try to have whole, real foods this year – mostly plant-based. But how can we do this and not have Thanksgiving boring and thus ruined. Focus on making veggies that people will want to eat. Roasted veggies, Brussels with chooped nuts or cheese, add some pomegranate or cranberry to a salad mixture or cooked greens, a vegetable pie, a vegetable loaf, vegetable pancakes, vegetable stuffing…the options are endless. And remember, the goal for THE eating occasion is the same as all the others – nutrient balance (1-2 servings each of carb,protein, healthy fat + unlimited vegetables) so be strategic. If you know you want pie, pass the potatoes or have just a taste (but count it) and save the other bites for the pie. What about beets,beans, bread, battered shrimp (ok was just seeing if you were paying attention) – make sure to take your AKA menu worksheet list and check it at least twice before the holiday so that you know what all counts as a carb, a protein etc. Have your eating occasion, then be done and yes, you can have leftovers as long as they are part of the next nutrient balanced eating occasion. And finally, get active! With the day off, there’s really no excuse to not get in at least an hour if not 90 minutes of activity. Please check out the GMA Health piece here. A tiny seed, an ancient grain, the next wonder supplement – inquiring minds are wondering what is this seed and why is everyone from athletes to doctors to food manufacturers saying “add some chia to your diet” for optimal health? Chia comes from a plant (salvia hispanica) in the mint family which grows around the world at latitudes 15 degrees north or south of the equator. Despite having an attractive blue flower which makes chia plants seem appealing, the plant naturally fends off predators and humans alike as its stems are bitter tasting so we harvest the seed instead. The seed, either black or white, contains a good source of fiber, and vegetarian omega 3 fatty acids. Nightline piece seems to condemn Gluten-Free diets? But are all GF diets created equal? What do you think of this assessment of gluten-free diets? ABC NEWS Is Gluten-Free Healthy? I found the info a bit off and the one-size fits all assessment of gluten-free diets very off. It’s true that we get great nutrients from high quality gluten containing foods but we can also get them from high quality gluten-free foods too. YES you CAN have a very healthy gluten-free diet if you choose nutrient-rich whole ORGANIC foods – many of which naturally contain nutrients like calcium and B vitamins that the doctor in this segment said could be deficient in a gluten-free diet (and what’s more important is that many of our best sources of calcium come from foods in nature that naturally have no gluten in them!). When it comes to who can benefit from a gluten-free diet, practitioners like myself continuously see that there are people who are gluten intolerant or who have an auto-immune disease where avoiding or reducing gluten intake improves their symptoms. These individuals still need to focus on other components of the diet such as reducing known irritants and choosing anti-inflammatory foods, but gluten still appears to play a key role. Net net, not all gluten-free products are created equal so not all gluten-free diets should be compared as equals. Organic, whole food, mostly plant-based diets provide nutrition for optimal health – it’s what I call a qualitarian diet — and if you add to it gluten-free because that’s an issue for you, you can gain health improvements overall as well. RSVP as space is limited (see invitation below). If you cannot attend, please RSVP so you can receive information and products post-event.